I knew I was pregnant, two days after trying to conceive you, I felt different. I was moody, greasy, and so excited because I knew you were with me. Over the next nine months I felt you grow, you are such a gentle little soul. I loved being pregnant even though I lost any desire to eat and my back ached. We decided to give birth to you at home. We made our decision to have you at home because our home feels so safe and peaceful, and we fully trusted the experience of our amazing midwives and doula. The month leading up to your arrival was busy preparing for a home birth. “Tarps lots of tarps” Lisa the midwife said. You were due October 22, 2009 and that day came and went. Then a week past, Grampa and Joanne showed hoping to meet you soon, as it couldn’t be much longer now. Halloween arrived, and still no baby Natalia. We had The Weber’s and Rosse’s over to go trick or treating, but warned them that they may be delivering a baby. Perhaps from all the excitement I started to feel some regular contractions although they were not painful. I called Jaquie “ Am I in labour?”, and she replied, you don’t have to ask the question when you are in labour because you will most defiantly know. I went to bed that night convinced I would be in labour by the morning. The next two days came and went. At this point we were being monitored regularly at the hospital. On Sunday, Lisa said I was 1 cm dilated, that was disappointing news. I was hoping to hear, WOW, your 5 cm dilated, this baby is going to fall out of you. Starting to feel a little stressed at being 10 days over due, I started to pull out the big guns. I had a stretch and sweep, acupuncture and had the ingredients for the castor oil and verbena cocktail. On Monday morning, your daddy excitedly made my the very gross cocktail. He had a silly grin as I choked down this thick almondy sticky slimy cocktail. Then off to the hospital we went for another ultra sound. Jaquie had warned us that I would be in labour 4 hours after drinking that mixture. As I was coming out the hospital, the midwives called, “ We were wondering if you could hold off on drinking the castor oil, as we are really busy today?” Uh – Oh…its too late, I already drank it. Jaquie called 3 hours later to see if there was any action, a little but nothing too exciting. At this point ,I kicked out grandpa, Joanne and Ardyn, this needed to happen and I thought perhaps I am not letting go cause everyone was here. When they started to walk out the door, boom, contractions! Debbie “ okay its time to get out of the tub and on to the bed.” I waddled over to the bed, requiring assistance to get on the bed. It felt like I was climbing a mountain with a bowling ball between my legs. I fell to my side. A contraction came with great force followed by the need to push. I was pushing, no one told me to push, I just started to push. It felt good to push. It took the pain away, I was close. Then another gasping contraction followed by an even bigger push. I know how to do this. Daddy was holding my leg, Jaquie was holding my crushing hand, and the midwives standing by “ thats it Raeghan, you are doing awesome.” I could feel you against my back, trying to make you way out. It felt enormous, wide open, how could this be crazy pressure. I feel you I feel you, the your head peaked through, so full of hair. Then on more push and you arrived! So in love, so beautiful, so calm, so peaceful, so perfect. 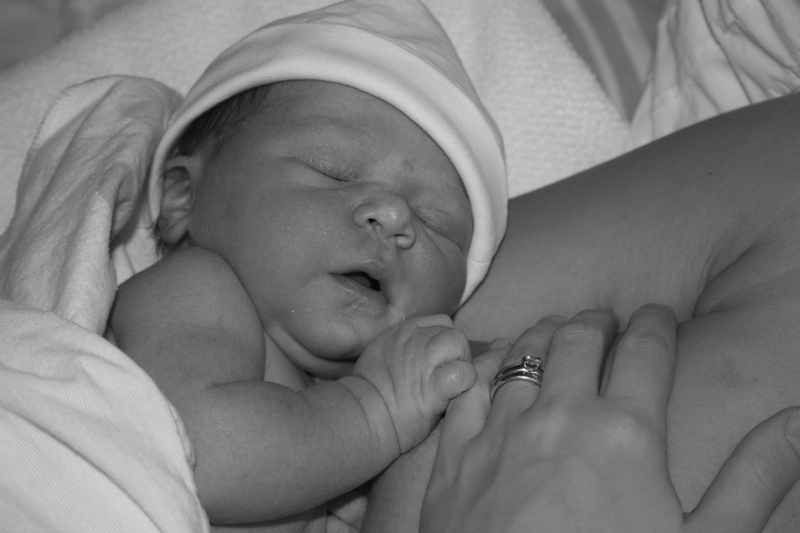 You were placed on my stomach, and crawled your way up to my chest and started nursing. Perfection. I love you so much baby Natalia. We starred at each other and time stood still. This experience healed me, and made me in awe of my body, nature, and the kindness of the universe. Thank you for coming into our lives we are so blessed.